IBM Content Navigator enables you to extend your existing IT content investments and tap the power of cloud-based applications to truly deliver a comprehensive content management solution whether users are in the office or on the go. Gain flexibility with a unified interface that seamlessly works with desktop and mobile devices. Leverage the open architecture framework to create secured deployable applications quickly. Manage key business content efficiently and productively. Integration with Box, Microsoft SharePoint, Microsoft Office and Office Online enables you to extend your existing IT investments to deliver a truly comprehensive content management solution. Gain the flexibility of an easy-to-use unified interface for both desktop and mobile devices. Leverage the open architecture of Content Navigator to create your own unique apps to manage and access your critical business content efficiently and productively. Leverage Content Navigator’s open architecture to custom tailor the ways you manage your business content. Develop content intensive solutions and applications through open APIs. Build your own plug-ins for Content Navigator. Gain additional capabilities from IBM Business Partners including information rights management, digital asset management and more. Access and manage a diverse variety of content sources, including Box cloud-based content, whether on the go or from behind a desk. Content Navigator is engineered with a plug-in architecture that uses flexible industry-standard APIs to quickly develop robust content solutions for all content sources no matter where your users are. Provides users with hybrid options for custom plug-in development using popular technologies like React. Provide a single platform for your users to engage all of your trusted content, regardless of where it resides or where your users are located. 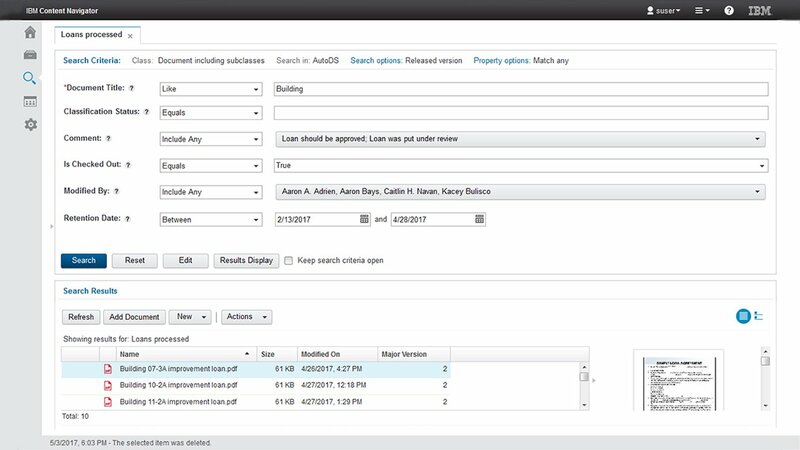 Content Navigator enables your users to add documents, folders, check in and check out content, tag, comment and view properties. Integrate content intensive solutions and applications through open APIs to promote extensibility and data integration. Deliver all of your content on any device to drive better and faster decision making. Provide superior access to trusted content anywhere across the enterprise. Enable documents to be redacted automatically based on the role of the requester, blocking out information according to a user's specifications. Speed response time by facilitating immediate access to the right information, streamline security, reduce storage and document management costs by keeping only the original document of record. Collaborate and focus with Teamspaces to organize and share content for teams and project sites across the enterprise. Teamspaces provide a focused view of the relevant documents, folders, and searches that team and project site members require to complete team-based tasks. You can use Teamspaces to organize and share content, facilitate recurring work, and collect documents, folders, and searches that are related to a project sites and teams. Work more efficiently in a new modern interface designed to be more intuitive and easier to use. Various elements of the user interface such as color, layout, enhanced data presentation, and button behavior have all been improved. Rotate, cut, and copy one or more pages from existing documents and paste them to a new document or an existing document within IBM FileNet® P8 and IBM Content Manager - note that all documents must be in the same repository. Edit documents using registered desktop application such as, PDF, Microsoft Office, Visio, and Project. Create new documents using document templates. Auto save and check in changes back to the repository. Delete local copies from your desktop.